Were Hedge Funds Right About Ecolab Inc. (ECL)? Is Ecolab Inc. (NYSE:ECL) a bargain? The smart money is getting more optimistic. The number of bullish hedge fund positions moved up by 4 in recent months. Our calculations also showed that ECL isn’t among the 30 most popular stocks among hedge funds. 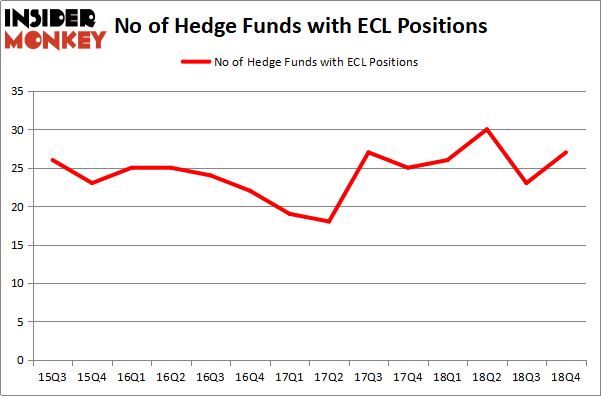 ECL was in 27 hedge funds’ portfolios at the end of December. There were 23 hedge funds in our database with ECL positions at the end of the previous quarter. If you’d ask most market participants, hedge funds are seen as underperforming, old financial tools of yesteryear. While there are greater than 8000 funds trading at present, Our experts choose to focus on the leaders of this group, about 750 funds. 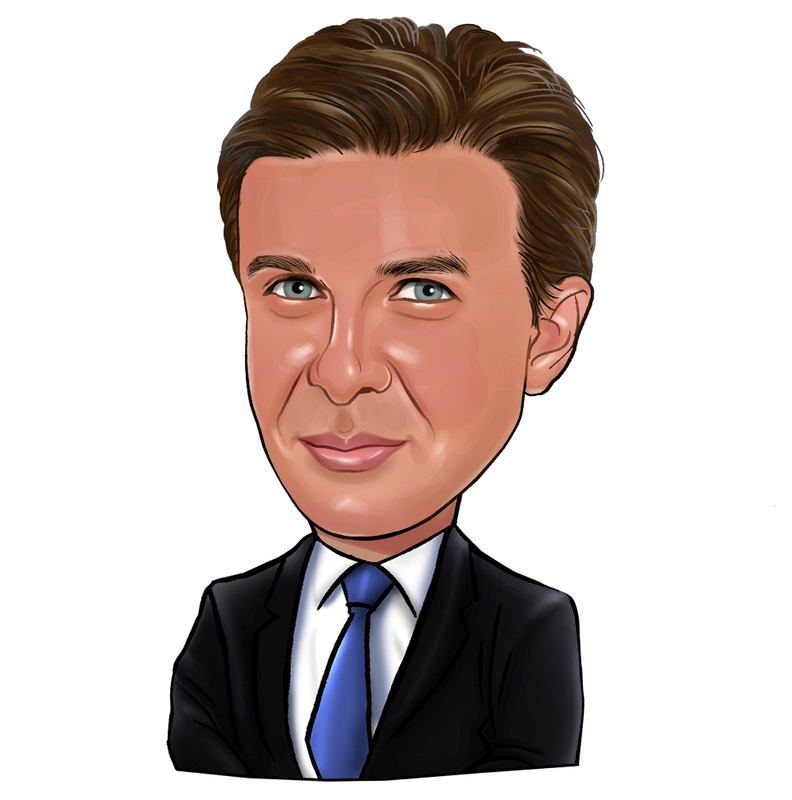 These money managers handle most of the hedge fund industry’s total asset base, and by shadowing their finest equity investments, Insider Monkey has figured out a few investment strategies that have historically defeated Mr. Market. Insider Monkey’s flagship hedge fund strategy outrun the S&P 500 index by nearly 5 percentage points annually since its inception in May 2014 through early November 2018. We were able to generate large returns even by identifying short candidates. Our portfolio of short stocks lost 27.5% since February 2017 (through March 12th) even though the market was up nearly 25% during the same period. We just shared a list of 6 short targets in our latest quarterly update and they are already down an average of 6% in less than a month. Let’s view the new hedge fund action regarding Ecolab Inc. (NYSE:ECL). How have hedgies been trading Ecolab Inc. (NYSE:ECL)? At Q4’s end, a total of 27 of the hedge funds tracked by Insider Monkey were bullish on this stock, a change of 17% from the second quarter of 2018. Below, you can check out the change in hedge fund sentiment towards ECL over the last 14 quarters. So, let’s check out which hedge funds were among the top holders of the stock and which hedge funds were making big moves. When looking at the institutional investors followed by Insider Monkey, Michael Larson’s Bill & Melinda Gates Foundation Trust has the number one position in Ecolab Inc. (NYSE:ECL), worth close to $643.4 million, accounting for 2.9% of its total 13F portfolio. On Bill & Melinda Gates Foundation Trust’s heels is William von Mueffling of Cantillon Capital Management, with a $343.6 million position; the fund has 4.1% of its 13F portfolio invested in the stock. Remaining professional money managers with similar optimism consist of Boykin Curry’s Eagle Capital Management, Ian Simm’s Impax Asset Management and Ryan Pedlow’s Two Creeks Capital Management. As one would reasonably expect, key hedge funds were breaking ground themselves. Luminus Management, managed by Jonathan Barrett and Paul Segal, established the biggest position in Ecolab Inc. (NYSE:ECL). Luminus Management had $43.7 million invested in the company at the end of the quarter. Bruce Kovner’s Caxton Associates LP also made a $2.4 million investment in the stock during the quarter. The following funds were also among the new ECL investors: Ken Griffin’s Citadel Investment Group, Ben Levine, Andrew Manuel and Stefan Renold’s LMR Partners, and Michael Gelband’s ExodusPoint Capital. Let’s check out hedge fund activity in other stocks – not necessarily in the same industry as Ecolab Inc. (NYSE:ECL) but similarly valued. We will take a look at Northrop Grumman Corporation (NYSE:NOC), Vertex Pharmaceuticals Incorporated (NASDAQ:VRTX), FedEx Corporation (NYSE:FDX), and Illinois Tool Works Inc. (NYSE:ITW). This group of stocks’ market values resemble ECL’s market value. As you can see these stocks had an average of 34.25 hedge funds with bullish positions and the average amount invested in these stocks was $1351 million. That figure was $1832 million in ECL’s case. FedEx Corporation (NYSE:FDX) is the most popular stock in this table. On the other hand Illinois Tool Works Inc. (NYSE:ITW) is the least popular one with only 28 bullish hedge fund positions. Compared to these stocks Ecolab Inc. (NYSE:ECL) is even less popular than ITW. Our calculations showed that top 15 most popular stocks among hedge funds returned 19.7% through March 15th and outperformed the S&P 500 ETF (SPY) by 6.6 percentage points. Small number of hedge funds were also right about betting on ECL, though not to the same extent, as the stock returned 18.4% and outperformed the market as well. Hedge Funds Have Never Been This Bullish On Thermo Fisher Scientific Inc. (... Were Hedge Funds Right About Buying Costco Wholesale Corporation (COST)? Were Hedge Funds Right About Buying United Technologies Corporation (UTX)? Do Hedge Funds Love Diageo plc (DEO)? Were Hedge Funds Right About Dumping Twenty-First Century Fox Inc (FOX)? Itau Unibanco Holding SA (ITUB): Are Hedge Funds Right About This Stock?